How to Play Movies on Galaxy S7/S7 Edge(DVD, iTunes, 4K and HD Video)? Outline: Cannot insert a DVD to your Galaxy S7/S7 Edge for direct playing? Why can’t download iTunes to Galaxy S7/S7 Edge? How do I play any HD and 4K videos on Galaxy S7/S7 Edge? How to Get the best Galaxy S7/S7 Edge video player? And so on. If you have these question, you have come to the right place! Samsung Galaxy S7 has a 5.1-inch screen with 2560×1440 resolution for 577 ppi and Galaxy S7 Edge has a 5.5-inch screen with 2560×1440 resolution for 534 ppi, so that Galaxy S7 or S7 Edge can ensure an excellent cinema-like movie watching experience. If you plan to move your iTunes movies, TV shows, 4K/HD Videos or DVD library to Galaxy S7 or S7 Edge for enjoying on the go, the following 7 parts are quite helpful for you. Part 3. How to Transfer Video/Music files to Galaxy S7/S7 Edge? Part 4. How to Choose the best Video Player for Galaxy S7/S7 Edge? Part 5. How to Watch DVD movies on Galaxy S7/S7 Edge? Part 6. How to Watch iTunes movies on Galaxy S7/S7 Edge? Part 7. How to Watch SD/HD/4K videos on Galaxy S7/S7 Edge? Like all smartphones, Samsung Galaxy S7/S7 Edge also has limited its playback support for video and audio file formats. 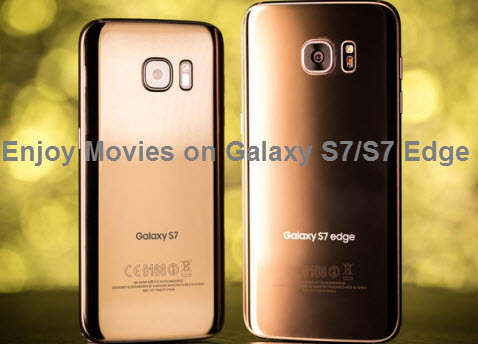 If the video and audio files that you are going to move to Galaxy S7/S7 Edge are included in above list, you will have no problem to watch your favorite movies and TV shows on Galaxy S7/S7 Edge. Video: DVD, ISO image files, H.265, VOB, MOV, MPG, MPEG, Tivo, AVI with most codec, MTS, M2TS, ASF, 3GP, RMVB, WTV, OGV, MXF, etc. You’re guaranteed to know your phone much more after this as well as the best video settings and format for your device. Please continue reading for more information. Here is the best video setting for the Galaxy S7/S7 Edge: resolution, frame rate, bit rate, channel, etc. If you have downloaded or recorded a HD (1080P) or even 4K UHD movie that are not supported by Galaxy S7/Galaxy S7 Edge, you need to convert those HD/4K movies to Galaxy S7 (Edge) supported formats like MP4 (MPEG-4/H.264) to avoid formats incompatibility during watching movies on Samsung Galaxy S7/S7 Edge. Part 3. How to Transfer Video/Music fiels to Galaxy S7/S7 Edge? Just connect your Samsung Galaxy S7/S7 Edge with Samsung Kies 3, you will be able to synchronize data from Kies to Galaxy S7/S7 Edge. Step 1: Connect the USB cable with the slot on your Samsung Galaxy S7/S7 Edge and the USB slot on your PC. Step 2: Open the notification panel and you should see a notification with “Connected as a media device”. Step 3: Open this entry and activate “Connect as” and “Media device (MTP)”. Step 4: Now switch to your PC and open the file manager or Windows Explorer. Step 5: Now you should see the entry “Galaxy S7/S7 Edge”. Step 6: Open this entry and you see the folders like “music”, “videos” or “download”. Now just drop your files in the folders and you’re done. Step 1. Connect Samsung Galaxy S7/S7 Edge to PC with the USB cable that comes with the Galaxy S7/S7 Edge. Step 2. Launch Windows Media Player on PC, and on the left side bar of Windows Media Player, you’ll find the Galaxy S7/S7 Edge icon. Step 3. Click on the “Sync” button in top right corner. Drag music, videos, and photos to the “Sync list” area. Here you can drag music, videos, and photos from both the Windows Media Library and your PC folders. Step 5. Move to the left side bar to click “Sync status” under your Galaxy S7/S7 Edge option to check whether the videos, music and photos have been copied and transferred to your Samsung Galaxy S7/S7 Edge. MobileGo’s powerful multi-files manager makes it easier than ever to download, manage, import & export your music, photos and videos with the push of a button, in real time, all in one location. De-duplicate contacts, switch devices(Tips for safely switching devices), manage your growing app collection, backup & restore and even send messages from your desktop. It’s all possible with MobileGo! Over 7 million Android phones have been helped! Ok, now how to move all supported movies to Galaxy S7/S7 Edge from computer. It also can be divided into two occasions, continue to read. Step 1. Launch the MobileGo software on your PC which has existed on your computer. Step 2. Connect your Samsung Galaxy S7/S7 Edge with your PC by its matched USB cable and wait for a while until the program successfully detected your phone. And your phone will show on the program interface. Step 3. Find out the “Video” option on the left side of the “My Device” interface of the program, and click on it. Occasion 2: If the movies are in your old phone, and you want to transfer them to your Samsung Galaxy S7/S7 Edge, you need firstly to copy the movies to your computer. Then following the same steps as above to realize the video transfer. What special in this video transfer part is: When the video format that you import cannot be supported to play on your Samsung Galaxy S7 or S7 Edge, the MobileGo software will ask you whether you want to covert the format to the supported format for your phone or not before the videos being transferred to your phone by a pop-up small window. According to your need to choose yes or no. It’s really a very convenient function for the users. Samsung’s removed its Video Player apps from Galaxy S7/S7 edge. It’s unclear why Samsung has made this switch, but we presume it has something to do with the amount of content available through the Google Play Store. I, myself, am a subscriber of Play Music All Access and use it religiously on my Galaxy S6 edge+ — so it’s pretty safe to say that I’m happy with the company’s decision to axe its default services. After all, I can’t even remember the last time I opened Music Player. The best three Free video players listed above may greatly help you play movies and TV shows on Galaxy S7/S7 Edge, but there should still be some problems to concern, especially playing DVD movie, iTunes movies and TV shows, 4K/HD videos on Samsung Galaxy S7/S7 Edge, keep reading on. For someone who prefers to collect DVDs but needs to watch them on Galaxy S7/S7 Edge anytime anywhere, it is suggested to rip DVD to Galaxy S7/S7 Edge using a DVD ripper to handle the problem of no optical drive to directly play DVD discs. Why? It’s because of DVD copy protection and Galaxy S7/S7 Edge don’t have a built-in DVD-ROM or DVD player. Meanwhile, It also isn’t as easy as you might think, just insert the copy-protected DVD (encrypted) into your hard drive and do “copy + paste”. To deal with such issues and get rid of all the worries in playing all DVD movies on Samsung Galaxy S7/S7 Edge, you might have to take the advantage of some professional DVD Ripper softwares. Here we recommend Aimersoft DVD Ripper for you. It is certainly one of the easiest software to use. 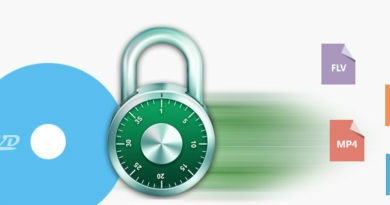 It can detect any type of copy guard and remove the protection from your DVD like CSS, region code, RCE, UOP, Sony ArccOS, Disney X-project DRM and rip any DVD (including homemade discs and latest commerical DVD movies) to Samsung Galaxy S7/S7 Edge playable formats without worrying about the file size, memory and compatibility. You can also rip DVDs for playing on any other smartphones, computer, tablets, TVs, game consoles, VR headsets, etc. What’s more, you can extract DVD background music to play on Samsung Galaxy S7/S7 Edge. With the NVIDIA? CUDATM technology, the conversion is processed on NVIDIA’s GPU instead of your computer’s CPU, leaving more of your CPU available to handle other applications. That means Aimersoft DVD Ripper has six-time-faster standard and high-definition video conversion, higher quality, and smoother playback for all DVD movies on Galaxy S7/S7 Edge. Both PC and Mac versions to are available here to help you rip DVD for Galaxy S7/S7 Edge phone. User Guide: How to Rip DVD to Galaxy S7/S7 Edge Supported formats? Insert your DVD into your computer’s DVD ROM or RW drive. Launch Aimersoft DVD Ripper, then click on the “Load DVD” button in the upper left of the program’s window, next select your DVD drive in the “Browse For Folder” dialog box and click “OK”. The program will read and load media contents on the plastic disc in a few seconds. Besides DVD discs, the program also can load and convert DVD folders, ISO files, IFO files from hard drive for Samsung Galaxy S7/S7 Edge. By clicking the dropdown list of “Subtitles”, you can select your preferred subtitles while viewing your DVD movie on Galaxy S7/S7 Edge. If you want to merge DVD titles into one large file, return to the main interface and select two or more titles you want to combine, then check the “Merge into One File” option at the bottom of the main interface. 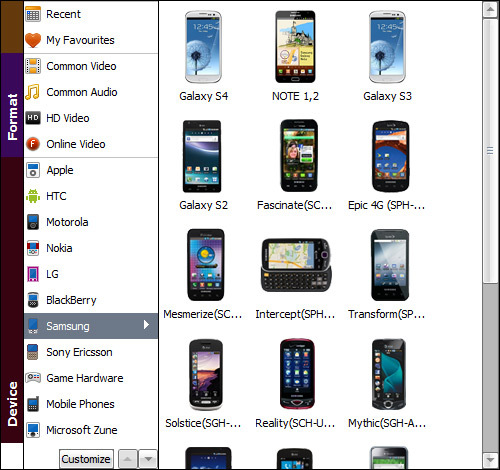 Click the “Browse” button to specify a destination folder. Click the “Profile” drop-down menu and select the output video format as .MP4(H.264/MPEG-4). Certainly you can also pick other video formats that Samsung Galaxy S7/S7 Edge smartphone supports like M4V, AVI, WMV, 3GP, 3G2, etc., you can go back to the “Part 1” to learn more Galaxy S7 supported formats. In addition, you can also directly choose preset video format for Galaxy S7/S7 Edge from “Samsung > Samsung Galaxy S4”, the output videos could fit on your Galaxy S7/S7 Edge perfectly. 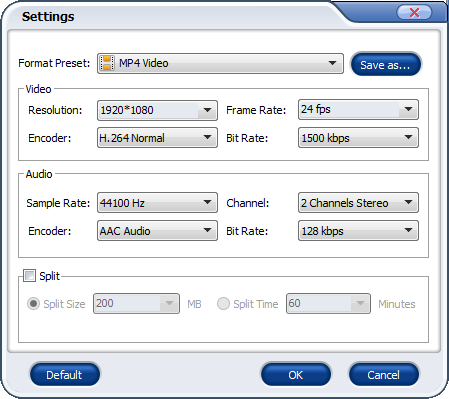 Tip: You can also click “Settings” to change the video encoder, frame rate, resolution, etc. Remember the file size and video quality is based more on bitrate than resolution which means bitrate higher results in big file size, and lower visible quality loss. Go back to “Part 2” to get the best settings. When you have finished all the above settings, you can simply click the “Start” button on the main interface and let the software do the DVD to Galaxy S7/S7 Edge conversion for you. After the conversion, click “Find Target” to locate the converted movie files and then transfer them to your Galaxy S7 or S7 Edge for watching anytime anywhere. If you have got the new one and want to sync iTunes movies and TV shows to Galaxy S7/S7 Edge, you have come to the right place! See also: How to Extend Rental Time of iTunes Movie Rental? Most the purchased movies or rent movies from iTunes Store are DRM protected, that is to say, you can’t play them directly on S7/S7 Edge (bcause it’s a non-Apple Product), and you need to authorize the device or computer to play them. Does it mean we are tied by Apple in our whole life and cannot own the contents we bought from the iTunes Store with the freedom of playing them anywhere we want? Not exactly. We can use iTunes DRM removal tools to bypass the FairPlay DRM protection and make our iTunes movies and TV shows playable on Galaxy S7/S7 Edge or any non-Apple devices with any media player programs. After downloading the best DRM Media Converter, follow the wizard to install it and then launch the program. Click the “Add…” button to load the iTunes video files. You can also drag and drop to add files. Batch conversion is available so you can add many videos at one time. Click “Video files to” and choose MP4 as the output format. 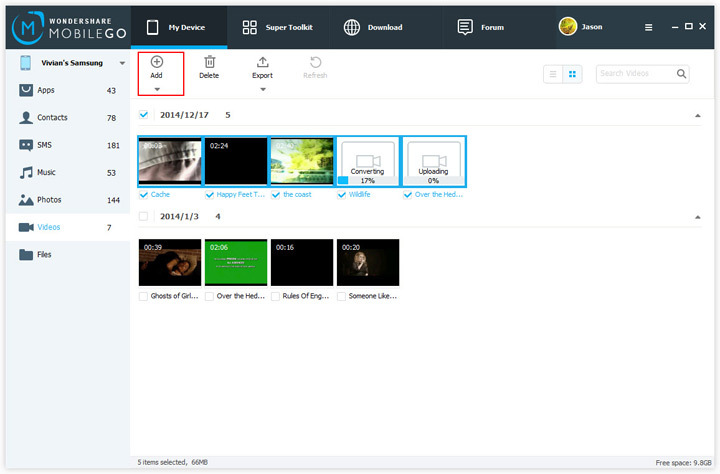 You can also select AVI, WMV, FLV, MKV, etc. However, MP4 works best on Galaxy S7/S7 Edge. You can also directly choose “Samsung”, then select “Galaxy S5” as your output file format, the output videos could fit on your Galaxy S7/S7 Edge perfectly. Tip. If you like, you can enter “Settings” option to adjust profile parameters, such as video codec, bitrate, frame rate, size, etc to get better video and audio quality on Galaxy S7/S7 Edge. Click the big “Start” button on software main UI to start iTunes DRM M4V movie to Galaxy S7/S7 Edge MP4 conversion. 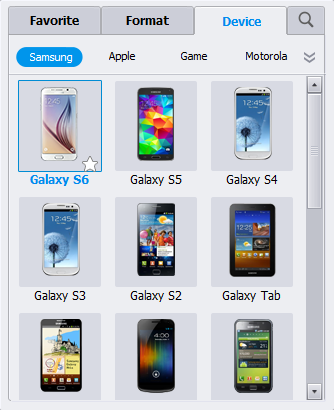 When conversion completes, click the “Find Target” icon to locate the DRM-free movies, then you can go the Samsung Galaxy S7/S7 Edge settings and switch on USB debugging, and connect your S7/S7 Edge to the computer so that you can check your device on computer and it will be read as a disk. Last, you can drag and drop or copy the converted iTunes movies from PC to Galaxy S7/S7 Edge. Now, you are ready to get any iTunes movies and TV shows for Galaxy S7/Edge big screened movie experience on your next train of plane journey. Then, it will be like a portable cinema for you. If you have many wonderful 4K videos, H.265, XAVC, 4K AVI, 4K MP4, 4K MKV, 4K MOV, 4K MXF, HD MKV, VOB, MPG, VOB, MOV, MPG, Tivo, HD/Common AVI with most codec, MTS, M2TS, TS, ASF, WTV, OGV as well as downloaded videos etc., and want to watch them on Galaxy S7/S7 Edge with no ads or virus when I was in spare time, you’ll find you can’t able to watch them directly on Galaxy S7/S7 Edge. Not all the video formats can be supported by the S7. If you come across some video files that fail to play on it, the only solution is convert these videos to Samsung Galaxy S7/S7 Edge supported formats. And you can quickly and easily finish this job as long as you have an excellent Samsung Galaxy S7/Edge video converter. Wondershare Video Converter Ultimate breathes new life into your gadget by converting any videos, including 4K/HD/Common videos to Samsung Galaxy S7/S7 Edge without video quality loss in a fast processing speed while other regular video converters make you sacrifice video quality during the conversion process and may get stuck halfway. Besides, its built-in YouTube downloader offers you a hassle-free way to download and convert YouTube videos to Samsung Galaxy S7/S7 Edge for offline playback, saving you a lot trouble as well as money. With simple and responsive interface, just four steps are needed to get videos to Samsung Galaxy S7/S7 Edge conversion process done. And the conversion speed and output quality are very breathtaking. Download and install Galaxy S7/S7 Edge Video Converter on your computer at first, use the link as given below for that. Then launch it on your computer once it has been successfully installed. After you run this program, go to its menu bar, and then choose “Add Files” option there to browse your computer and choose the 4K, 3D, HD or Common video files you want to import. Otherwise, you can choose to import these target video files by drag-and-drop. MP4 is widely supported by almost any device. So here, you can choose MP4 as the output format. Alternatively, you can select the directly optimized format for your device in its output format list. To open this app’s output format list, you just go to the Output Format pane to click the format image there. In the output format list, go to “Format > Video > MP4” or navigate to “Device > Samsung > Galaxy S6”, the output videos could fit on your Galaxy S7/S7 Edge perfectly. In the last step, you move the mouse to the bottom right hand corner of the window to click “Convert” button there. Now, you can see this Galaxy S7 Video Converter is starting the video conversion. 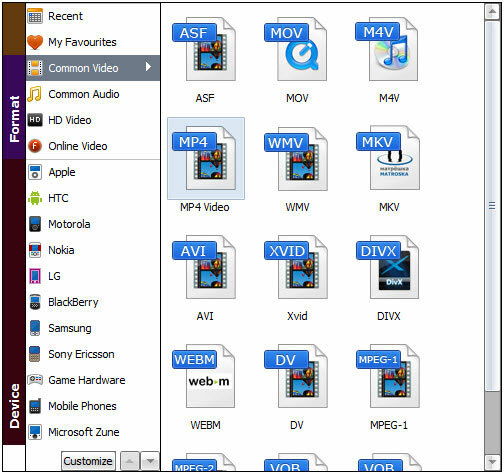 Click the “Open Folder” option at the bottom of this window after conversion, you can find the output video files. When you do it, just plug your Galaxy S7/S7 Edge into the computer, and then tranfer the output files to the device via cable. Now, you’ll be amazed to find these originally-unsupported videos, music and movies can be recognized and played smoothly on your Galaxy S7 or S7 Edge. 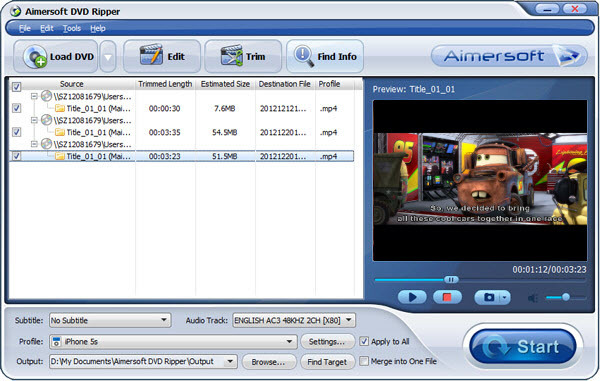 Aimersoft is a easy-to-use DVD digitizing tool. After a few clicks, the tool starts transfering media on plastic discs to MP4 format i desire and then transfer to my new Samsung Galaxy S7 Edge. With Intel Quick Sync Video being enabled, i used Aimersoft DVD ripper to convert a 2-hour DVD movie to H.264-based 720p video for my Galaxy S7, impressively, i got the resulting video in only 30 minutes. The resulting video keeps good picture quality and plays smoothly on my S7. I downloaded this DVD ripping software to rip my copy-protected Disney DVDs, and it worked on most of them except for the strongly encrypted DVD’s. Not bad for me. Wondershare Video Converter Ultimate is very handy for me! Easy to operate even for a newbie! Nice choice for ripping DVDs to play on Galaxy S7 Edge!